STEP, which stands for Science & Technology Entry Program, was first launched by the New York State Department of Education in 1986. Cornell University’s first STEP grant opened on July 1, 2015 and provides opportunities for 99 student participants in grades 7-12 to succeed in pre-college performance and ultimately in their science, technology, engineering and math (STEM) higher education pursuits. STEP serves economically disadvantaged and underrepresented minority students in the Ithaca City School District, specifically DeWitt Middle School, Boynton Middle School and Ithaca High School. Cornell STEP provides academic program services and activities that include tutoring, academic and career counseling, college planning, academic enrichment, internships and planning for students to enter higher education and pursue careers in scientific, technical fields and the licensed professions. One of Cornell STEP’s participants, Zareth Halaby-Perez, is currently wrapping up her sophomore year at Ithaca High School. She has been participating in an internship opportunity with the CHESS Xraise program. Zareth's assignment during her internship is, by design, self-paced, open-ended, and sufficiently vague to allow room for interpretation: use a rotating magnetic field to create an unusual phenomenon for public display. Zareth isn't new to the visual effects. If she needed to commit to a career today, she's confident that she'd have a lot to offer in graphic arts and animation. But though she has always felt a strong pull towards mechanical engineering, school has only offered fleeting opportunities to design and construct something, much less to make something truly unique intended to be experienced by thousands of people. She signed up for this internship deliberately to explore this "engineering side of herself". Equipped with a small set of tools, a glue gun, some rare-earth magnets, and bins of appliances and recycled materials, she eagerly began digging in. Her first project made use of an old tube-type television. Its blue default screen, in the presence of a magnet, revealed the magnet's field lines in bright rainbow colors. She created a thin framework of wood, resembling a Japanese torii, holding a geared motor to rotate the magnet in the center of the screen. Her second project was to create a standing vortex in a clear container of water. This involved lots of trial and error. Two of the biggest challenges she would overcome were: getting the magnets to "lock in" to each other while spinning, and building a framework sufficiently strong to hold up eight pounds of water without toppling. 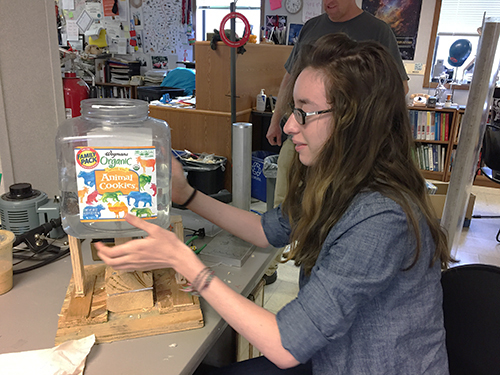 Zareth works under the guidance of mentor Erik Herman to design a water vortex exhibit using recyclable materials, strong magnets and ingenuity. It was apparent in both of these projects that her artistic vision was far more developed than her understanding of vertical structures, but it was her commitment to symmetry and aesthetics that provided motivation through the frustrating process of getting pieces of wood to stick together in a way that is both visually pleasing and stable enough. Both projects would also involve electrical motors. Though she vaguely remembered taking classes that involved electrical circuits, it took some experimentation to gain confidence in how to install a switch. This internship has allowed Zareth to interact directly with materials, through rapid prototyping, to offer her a refreshing complement to her school coursework. According to Zareth, “Set aside the constant frustration of not being able to make a motor spin correctly, the Xraise Internship has been an amazing experience for me. The incredible engineers over at the eXploration station were very welcoming, and have truly inspired me to have engineering a possible career path in my future."